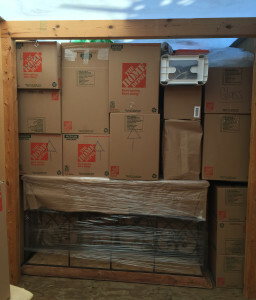 The most important part of a successful move starts with the proper packing and protection of your goods. Our experienced packers ensure that your items are properly prepared for storage/shipment inside your container, truck or trailer by using high quality packing materials and techniques that are tested and proven over time. From delicate items such as china and crystal to the shrink wrapping of your furniture for added protection, our specialists will pack exactly what you need packed. Whether you desire just one box or your whole house packed, our well trained experts use professional grade corrugated boxes to ensure the proper protection for your goods. These boxes come in small, medium, large and extra-large sized cartons. Additionally, wardrobe, mirror and dish-pack cartons are available. For those treasured over-sized items or high-valued articles that may require extra protection, our crating service offers wooden crates that are custom tailored to the size of you item, thus offering the maximum protection of your cherished belongings. Simple, convenient and cost effective. Let Pack and Load Service handle all your packing needs!